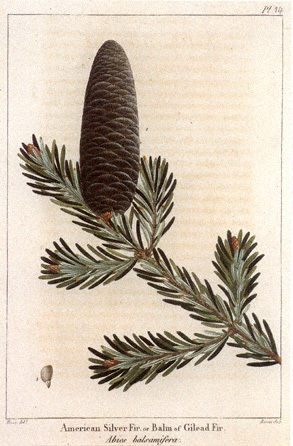 Douglas Fir (Pseudotsuga menziesii) is not a true fir at all, nor a pine or spruce. It is a distinct species named after Archibald Menzies, a Scottish physician and naturalist who first discovered the tree on Vancouver Island in 1791, and David Douglas, the Scottish botanist who later identified the tree in the Pacific Northwest in 1826. The species is known by a number of common names including Oregon Pine, British Columbian Pine, Red Fir and even Douglastree; however, the U.S. Forest Service settled on Douglas Fir some years ago. Douglas Fir is North America's most plentiful softwood species, accounting for one fifth of the continent's total softwood reserves. Habitat The two varieties of Douglas-fir occur in quite different ecosystems. The Interior variety grows in a variety of habitats including open forests with pinegrass and mosses beneath. On the coast, the forests are much more productive. Douglas-fir can grow with western redcedar, hemlock, and grand fir, with a lush layer of salal, huckleberries, Oregon-grape, and sword fern beneath. Many animals eat Douglas-fir seeds, including squirrels, chipmunks, mice, shrews, winter wrens, and crossbills. Bears often scrape off the bark on young trees and eat the sap layer beneath.